As a graduate of Le Cambre School of Art and Design, Marguerite Bartherotte was looking for an alternative way to show her work. Instead of using canvas, she now prints her paintings on high quality cotton woven in Portugal. Her designs are vibrat and creative with a high attention to detail and made for an excellent statement piece for any wardrobe. 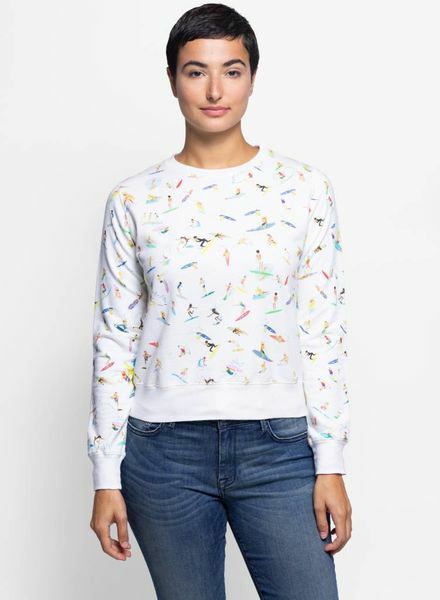 Long sleeve crewneck pullover with printed illustrations of surfers throughout. Japanese Love pattern cotton/silk blend button down shirt.